Textile mills in China are under more pressure to clean their supply chain; but how can they do so economically? This article was first published on the China Chemical Reporter website on 6 May 2017. Access the original publication here (only available to subscribers). Innovations in reactive dyes are helping to revolutionise the textile industry by delivering economic and environmental sustainability. Textile mills in China are under increasing pressure to create a cleaner and more transparent supply chain. China’s regulatory authorities have been introducing tougher environmental legislation and stricter enforcement policies for several years, and the nation’s legislators are now contemplating a tax on polluters, along with tax incentives to encourage companies to discharge cleaner air and water. International brands and retailers are being pushed to take more responsibility for their supply chains by environmentally conscious consumers, non-government organisations and regulators in their markets around the world. To cope with this greater scrutiny, the world’s top brands have created and designed their own extensive Restricted Substances Lists (RSLs) and have formed influential industry partnerships like the Zero Discharge of Hazardous Chemicals (ZDHC) Group. This initiative, together with ongoing efforts by NGOs, global brands, governments and even consumers are driving change at the mill level. Many mill owners also now have a greater awareness of resource scarcity and the environmental impact of industrial production. They want to contribute to a more sustainable future for China. The challenge is to do so economically. Reducing the industry’s heavy use of water is a top priority for China’s textile sector. China has 20% of the world’s population but only 7% of the planet’s fresh water. Pollution from agriculture and industry worsens the problem by further reducing the fresh water available for use. The textile sector is very dependent on water. To produce a simple cotton T-shirt requires approximately 2,650 litres of water from farm to factory to retail outlet. A substantial proportion of this water usage is used in just the dyeing phase of the production process. Up to 100 litres of fresh water, and very high amount of energy, is required to dye just one kilogram of cotton fabric. Much of this water ends up contaminated by the salt used to promote the absorption of the dye. This salinated wastewater cannot be safely consumed or used for irrigation, and is harmful to aquatic life. It is also difficult to treat. Industry use of hazardous chemicals poses similar problems. Reducing energy use and greenhouse gas emissions is another priority for China. The 13th Five Year Plan sets ambitious targets for the reduction of carbon emissions and energy intensity, which measures energy consumption per unit of GDP. The current Five-Year Plan is also the first to include a target for reducing volatile organic compounds (VOCs) in order to improve air quality. VOCs, which are used extensively in conventional textile production, are already included in the ZDHC restricted substances list. Joining top brands, suppliers, research institutes and industry associations worldwide, China Textile Information Centre is a contributor to the ZDHC initiative. Mills have to cope with all of these environmental challenges while also facing a more difficult economic environment. The global textile industry is now more competitive than ever, forcing mills to find new ways to reduce costs and raise productivity. In China, wages are rising along with the cost of energy and transportation. Plus, mills also have to manage price volatility in cotton and other raw materials. As a key supplier in the global textile value chain, Huntsman Textile Effects (Huntsman) saw the writing on the wall for the industry more than a decade ago. Huntsman has been working ever since to find answers to the sector’s toughest challenges. Huntsman believes that the issues are facing our industry call for increased investment in modern production technology and wastewater treatment facilities, more compliance monitoring, and greater research and development spending. Huntsman introduced AVITERA® SE in 2010. The first new reactive dye molecules to be invented for almost 20 years, the AVITERA® range represents a new generation of dyes comprising complex new molecules with several newly designed active reactive groups. Most reactive dye molecules have one or two reactive groups that bond with the fiber, allowing approximately 50%-85% of the dye to fix to the fabric. AVITERA® SE dye range has two to three reactive groups enabling high fixation rates. Using standard dyeing equipment takes an average of 30-40 litres of water, to dye and finish 1 kg of knitted cotton (excluding pre-treatment and finishing). The AVITERA® SE dye range reduces this to 15-20 litres/kg, thereby delivering water savings of up 50%. AVITERA® SE also improves production efficiency and offers good color fastness. The wash-off process requires a lower temperature of about 60°C, instead of closer to 100°C compared to conventional washing off. Less water is required and the washing process is up to 25% faster. This achieves significant cost savings and also slashes energy consumption by up to 50% and CO2 emissions by up to 20%. AVITERA ® dyes can be used on conventional dyeing equipment and do not require mills to make a capital investment. AVITERA® SE is also the first range of reactive dyes to be free from restricted arylamines. Fabrics dyed with AVITERA® SE dyes thus comply with the environmental requirements of leading brands and retailers. This helps mills maintain a positive image and boost the value of their brand while increasing yield, improving productivity and reducing processing costs. Synthetics fibers have been a growth powerhouse of the textile sector for decades, with a shift towards greater use of polyester-cotton (PES/CEL) blends in apparel and home textiles over the past 10 years or so. Dyeing these blends has remained problematic as the different fibers need to be treated separately. In both conventional two-bath exhaust dyeing and continuous two-step dyeing, an intermediate reductive clearing stage is required after the initial disperse dye bath to clean the unfixed disperse dyestuff before applying the reactive dyestuff. This intermediate process reduces mill productivity and competitiveness with a lengthy processing time, low fastness levels and reproducibility issues. The industry is therefore demanding solutions that reduce the time, energy and water required for dyeing different grades of PES/CEL blends. A combination of the AVITERA® SE and TERASIL® W/WW dye ranges from Huntsman meets this challenge. TERASIL® W/WW is an alkaline-clearable disperse dye, complementing the fast wash-off of the AVITERA® SE reactive dye. 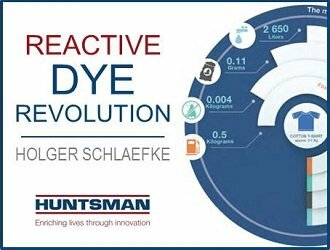 Compared to conventional exhaust PES/CEL dyeing, the Huntsman dyes reduce the dyeing process time by more than 40% and eliminate the need for intermediate reduction clearing. This also reduces water and energy use by around 50%. While reactive dyes have come a long way over the past few years, the textile industry today needs solutions that are even more sustainable, from both environmental and cost perspectives. Brands and retailers want innovative products that add value to their portfolios and help them stand out in an increasingly crowded market. Consumers want color, comfort and long-lasting performance. Over and above this, there is an ongoing need for sustainability. Mills are demanding faster and more robust dyeing procedures, and solutions to the challenges of higher raw materials prices and shorter product development cycles. They want to reduce water and energy consumption and remove hazardous chemicals from the supply chain. As the industry’s leading innovator, Huntsman Textile Effects continues to invest in products and processes to meet these challenges. This reinforces our commitment to address sustainability challenges, maximise productivity and meet customer needs, raising standards of the textile industry. Holger Schlaefke is the Global Marketing Manager of Huntsman Textile Effects, Singapore and manages the global product launches and promotion of the dyes business. He is in charge of developing global sales strategy, product development and management to add value to customers and the business. With over 30 years of extensive experience in the textiles industry as Regional Technical Specialist at Huntsman Textile Effects Shanghai, and Global Business Development Manager for Dystar and BASF, he brings a solid mix of commercial and technical expertise to the industry.